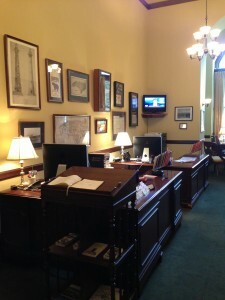 My summer internship experience began on Monday, July 15 in Senator Burr’s office. I work in the Russell building, which is a quick walk from Union Station and right near the Capitol. Union Station is hub for many DC tourists, shoppers, and commuting professionals. Whenever I look down over the food court, I see blobs of orange, green, and blue shirts signaling hoards of middle school students on tours. 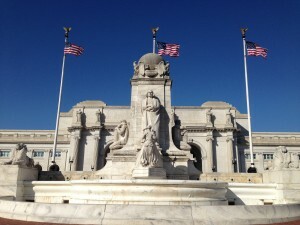 The metro is easy to navigate and many attractions on Capitol Hill are located in the area, such as the Library of Congress, the Supreme Court, and the National Mall. After work I have met with friends to walk around and see some of the most influential buildings in our nation. When I arrived on the first day, my supervisor went over the procedures of the office and spent time getting to know all the new interns. After the introduction, I went to the ID office to receive my intern badge. Little did I realize that it was like receiving my license and therefore, freedom. The ID allows me to use the underground subway and tunnels that connect the Senate buildings and the Capitol Building, which are used by many Senators travelling back and forth from their offices to the Senate Gallery. Everyone is friendly, and I often see Senator McCain smiling when I walk by. 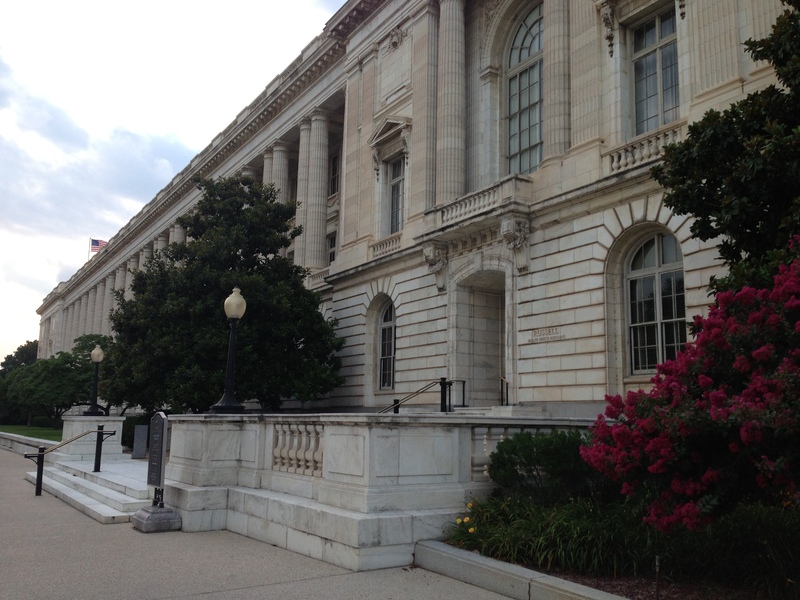 I can also use corridors in the Capitol that only allow authorized access only, which is convenient when I want to explore some day during lunch! One of my main responsibilities is to give tours to constituents. When I arrived in the Capitol Building I could not believe the amount of information and history that resides in the building! 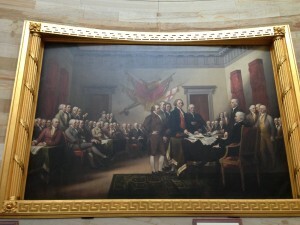 One of my favorite parts of the Capitol is the Declaration of Independence, painted by John Trumbull. 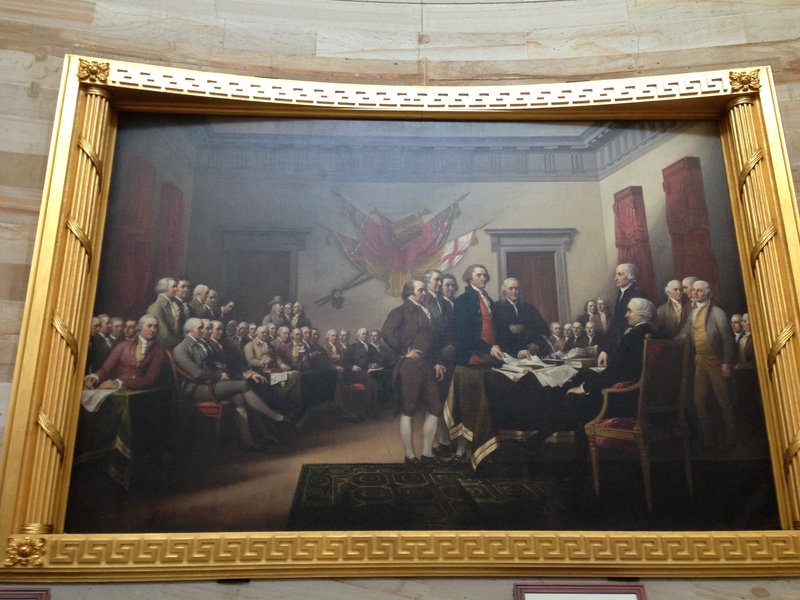 In the painting, Thomas Jefferson is taller and well-dressed compared to John Adams because he paid Trumbull to make him appear more prominent. Ironically, the two found friendship toward the end of their lives, but their rivalry was painted for posterity. The rest of the week was as busy as my first day, as I began giving Capitol tours for constituents, running errands, and answering phones. 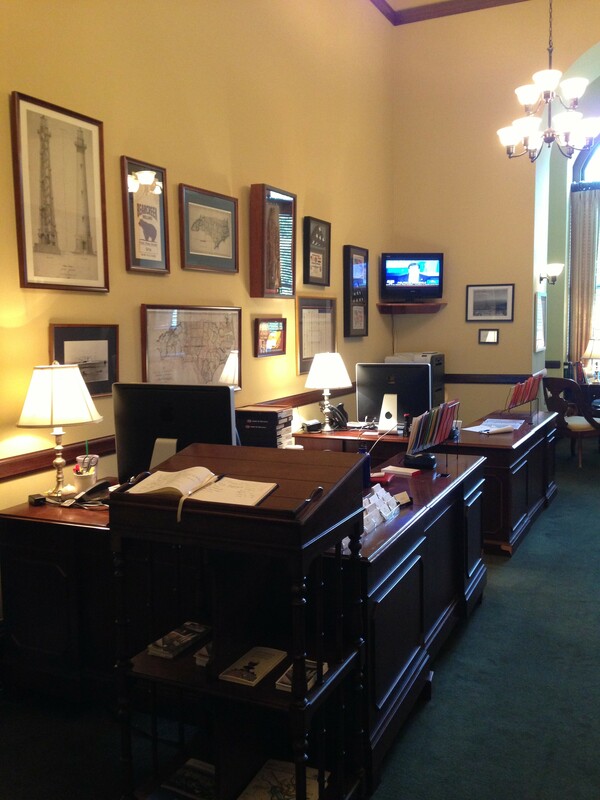 I have enjoyed my first week in the office and am excited to continue my internship! First, it expresses your gratitude to the person or team that has given you a great opportunity to gain experience and grow professionally. Second, you may be working alongside other interns – if they send thank you notes, you don’t want to be the intern who didn’t follow-up; if they don’t send notes, and you do, you’ll stand out! Third, employers are often thinking about whether their interns would make good, prospective full-time hires…following up is a way of showing your interest in coming on-board after graduation. Moreover, follow up is a way to maintain your network – you may need to call upon your manager for a reference or to make an introduction during your job search for a full-time role. So, cultivate that relationship!! Timely follow-up is a good show of faith. It’s a decidedly effective way to reiterate your interest in a firm. Thank you notes are always greatly appreciated, but unfortunately, they often have spelling or grammatical errors which can hinder a candidate in the process. So, I would suggest exhaustively proofreading any thank you notes or emails before they are sent. In regards to promptly addressing a full-time offer following an internship, we highly value a quick response. 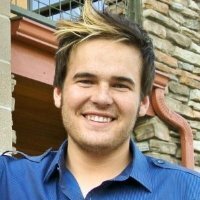 I am excited to introduce a new Diary of an Intern student contributor joining us the latter half of the summer! Follow her on her journey of discovering the world of work, skill development, and the lessons learned in the process. Let’s discover who she is, where she will be interning, why, and what she hopes to gain from the experience. Hello, my name is Rachel Lord and I am a rising senior at Wake Forest majoring in Politics and International Affairs with minors in History and Entrepreneurship and Social Enterprise. 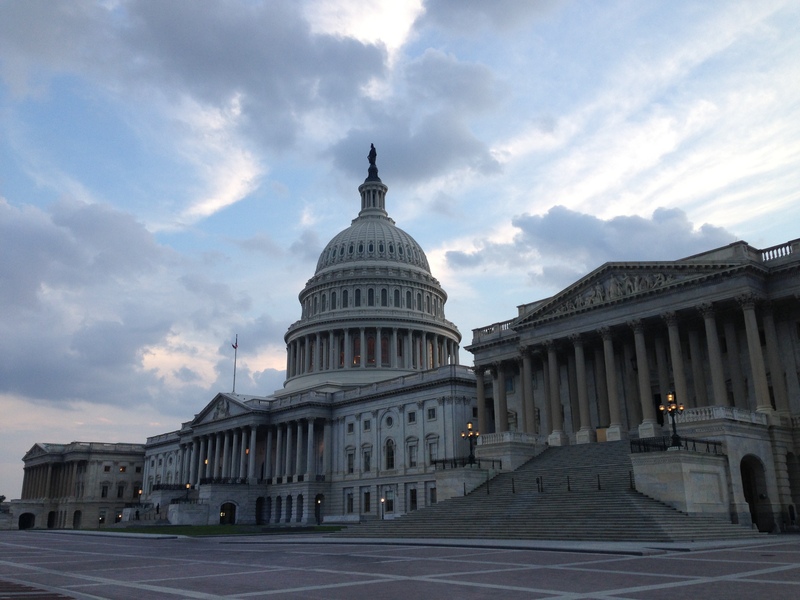 I am originally from Boston but have been given the exciting opportunity to spend my summer interning for Senator Richard Burr on Capitol Hill. I have heard numerous positive comments about his office and I cannot wait to start! After spending a semester with the WAKE Washington Program this past spring, I realized how much I love living and working in D.C. I am excited to expand my knowledge of the public sector with this internship after spending my semester interning for The Abraham Group LLC, an international consulting firm focused on energy. I have seen how policy affects private business and I look forward to gaining a new perspective from policymakers. I am thankful for the opportunity to share my experiences and hope you enjoy the blog! The opinions expressed by this blog are my own and do not reflect the opinions of Senator Richard Burr or any employee thereof. The office of Senator Burr is not responsible for the accuracy of any of the information posted. Our student interns are now over a month into their internships. They are meeting people, working hard, and developing skills. Let’s find out what they have been doing the last few weeks. I am one of the editorial interns for Details magazine, so I work with the editorial department (comprised of senior editors, associate editors, etc.). Throughout the day, I get assigned tasks from different editors, allowing me the opportunity to work with–and learn from many different people. The projects vary greatly, but I’m mainly doing research and fact checking, completing clip files (articles or stories already published in past magazines or newspapers) and writing reports for editors. Another one of the important responsibilities of an editorial intern includes transcribing interviews that the writers or editors have already conducted. I’m honing a lot of different skills that I have developed during my time at Wake Forest. Through the extracurriculars that I’m involved with, I have developed organizational and time management skills. I have had the opportunity to foster those already established skills while working with editors in a real-world setting. When an editor asks to finish a project by the end of the day, I need to make sure that I complete the task by the deadline – no questions asked. It’s a completely different environment than the one at college, where there is always another assignment that can hinder the time frame in which a task gets completed. I am the intern for the Communications department, so I am working closely with the Manager of Advertising and Promotions and the Public Relations Specialist. I am also working with the web designer and freelance PR specialist. I have been doing a lot of the Digital Marketing Manager projects until the new one that we have hired starts on July 8th. I am also working with other departments through various projects that come up, as well as learning about each department through our Friday lunch and learn series. 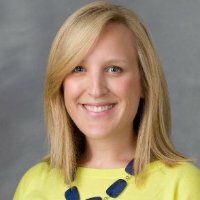 I am developing a wide variety of skills, from public relations and advertising to managing the High’s Facebook, Twitter, and Pinterest accounts, as well as organizational skills through organizing the High’s presence at the recent Old Fourth Ward Park Arts Festival. I have also learned how to operate time lapse cameras, work with outside companies for social media content and integrating it into a larger social media calendar, and guerrilla marketing through hand-delivering fliers to different local businesses. I honestly never know what each day will bring, and due to this variety, I have been able to develop a wide range of skills and learn how to do each task as it comes up. I try to figure out how to complete different projects as they come up as I learn better by trying first and then asking for help if I cannot figure out what I need to do. I have also honed my communications skills through what seems like millions of emails, as well as phone calls, conference calls, face-to-face meetings, etc. I have also worked on being proactive and trying to solve problems as they come up or any that I might anticipate. I also look for projects where I believe I can add value, such as the High’s Pinterest account. I noticed that not a lot had been done with it recently, so I asked my supervisor who was in charge of the account. She then gave me this responsibility, and it has become one of my favorite projects. I enjoy seeing what boards other museums have made, as well as seeing what pins get the most response from our followers. I have learned the value of seeking out projects that I find interesting from this experience.